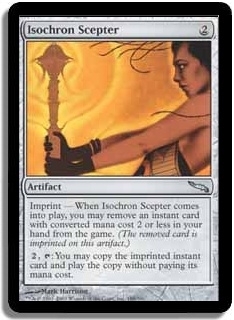 Imprint %EF%BF%BD When Isochron Scepter comes into play, you may remove an instant card with converted mana cost 2 or less in your hand from the game. (The removed card is imprinted on this artifact.) 2, T: You may copy the imprinted instant card and play the copy without paying its mana cost.